I came to a huge Brooklyn realization this year: I don’t go to Williamsburg. It’s not that I dislike Williamsburg–I actually like the neighborhood very much–it’s just so far! Sure, for Manhattanites, it’s a quick ride on the L train. But from Bay Ridge… The fastest way for me to get to Williamsburg is to go through Manhattan. Did you hear that? I have to go to another borough to get to a different part of my own borough. Ridiculous, I know. So why has this discovery become so apparent now? Well as I sit down to write my 2015 restaurant bucket list, I of course reflect on the 2014 list. No, wait…don’t click that link. It’s embarrassing really. It’s not like I didn’t eat out this year; oh I ate out plenty. But from my bucket list, I only managed a mere 5 of the 10 restaurants. Don’t worry I have excuses. When I added Toro to the list, I actually had planned on going to the original restaurant in Boston. Possibly better food (aren’t the originals always?) and certainly half the price. We arrived on a chilly Friday evening in March, our regular winter trip for the Extreme Beer Festival. With a no reservations policy, getting there at 6pm had to allow for a decent dinner time, right? Wrong. Apparently you have to arrive 2 hours before the restaurant opens to hope to be seated between 5 and 6pm. When we arrived at 6pm, our dining estimate was at least 9pm. No thank you. Now that I can’t drink beer anymore, I’m not sure when we’ll get to Boston next. I’m still striving for the original Toro, but maybe not in 2015. I have no excuse for Prospect. Pure laziness I guess. And Chef’s Table at Brooklyn Fare, well given the menu is mainly shellfish, I worry the meal (and expense) will be lost on me. But the other two–Shalom Japan and Bistro Petit (which has been on the list 2 years now)–are in Williamsburg. I’m actually kind of proud of myself for making it to one Williamsburg outpost, Xixa. So 2015 is all about realistic expectations. 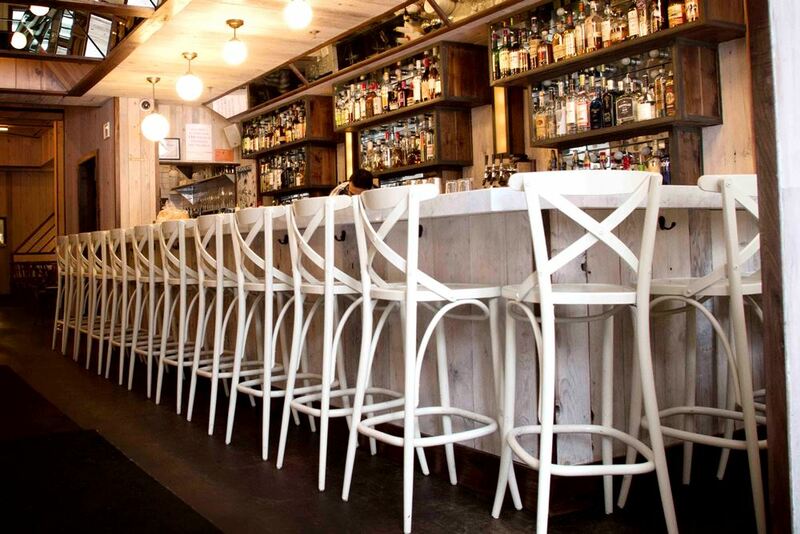 Ten restaurants, Brooklyn, Manhattan and beyond–one Williamsburg restaurant allowed. So here’s my list for the year. Are there any I’m missing? What restaurants are you looking forward to most in the new year? I also have a number of restaurants I want to try. I am much closer to Williamsburg and still don’t go it really isn’t easily accessible. Thanks so much for the recommendation. I’ve never heard of the Jedediah Hawkins Inn, though we do tend to spend our time further east than Riverhead. It looks beautiful (and much more affordable…); will absolutely check it out! 100% recommend Wangs in Park Slope. Except for a picnic table outside and a bench, it’s not really a “sit and eat” kind of place. But, it’s worth the trek via the R train – the Korean style wings and the Southern fried chicken are AMAZING! I’ve personally been intrigued by James and am curious as to what you thought of it. Did you go for brunch or dinner?